The heads of state discussed the problems of international and regional security, the improvement of mechanisms for countering challenges and threats and the development of the military potential of the Organization. The Declaration of the Collective Security Council was adopted, which reaffirms the determination to continue to coordinate the foreign policy positions of the CSTO member states and ensure the achievement of the Organization’s goals of strengthening peace and creating favorable conditions for the comprehensive development of our countries, stresses the need to strengthen the central role of the UN Security Council for maintaining international peace and security and reaffirms its commitment to avnoy and indivisible security, concern is expressed over the current situation around the Treaty on the Elimination of Medium-Range and Shorter-Range Missiles in connection with US declarations of intention to withdraw from it. The strategy fixes the priorities of the Organization’s activities until 2025, establishes guidelines for further development in all major areas of cooperation. The CSTO member states reaffirmed their determination to build relations with members of the world community on the basis of equality and indivisibility of security, to refrain in international relations from the threat or use of force, while giving priority to political and diplomatic methods in solving emerging problems. In today's meeting. The CSC Statement sets out assessments and approaches in relation to the most important issue of the day - the issue of countering international terrorism. The CSTO member states support the formation of a broad coalition on the basis of the provisions of the UN Charter, the norms and principles of international law. We are confident that the effective fight against terrorism cannot be waged without a reliable overlapping of the sources of its financing, blocking the channels of financial support. “The priority theme of the session was the issue of the state and prospects of development of the CSTO crisis response system. Interim results of implementation of the CSC Decision of September 23, 2013 “On Assistance to the Republic of Tajikistan to Strengthen the Tajik-Afghan Border” were reported to the heads of state., The CSTO Secretary General Nikolai Bordyuzha summed up. The CSTO Collective Security Council decided to provide military-technical assistance to the Border Guards of Tajikistan to strengthen the Tajik-Afghan border and made a statement on the situation in and around Syria After hearing the report of the CSTO Secretary General Nikolai Bordyuzha on the results of the Tajik-Afghan border survey, the presidents decided to consider the adoption of additional measures by the Republic of Tajikistan together with the CSTO member states to strengthen the Tajik-Afghan section of the state border. Based on the request of the Tajik side, the CSTO member states within three months, taking into account their capabilities, will provide free military technical assistance to the Border Troops of the State Committee for National Security of the Republic of Tajikistan. Session of the Collective Security Council December 19, 2012. 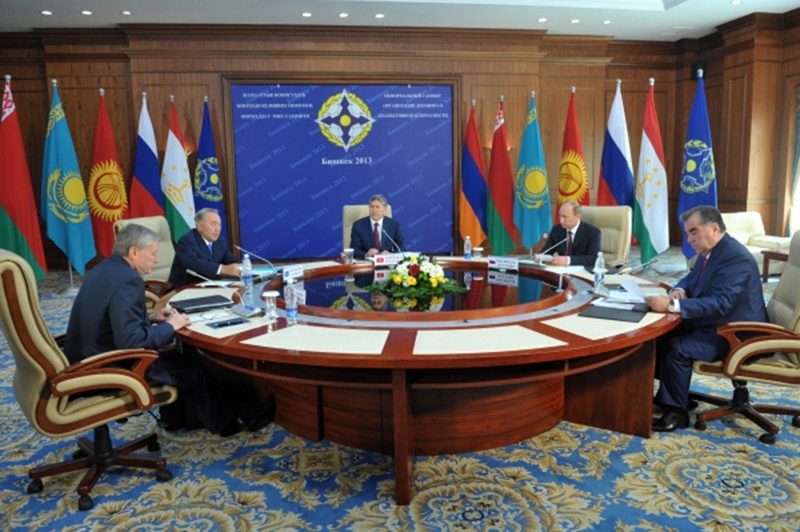 The heads of the CSTO member states at the session of the Collective Security Council made decisions on the development of the military component until 2020, on developing a system of collective response to emergency situations, suspended Uzbekistan’s membership in the Organization’s activities, determined measures to counter threats emanating from the territory of Afghanistan, and appointed the head Joint CSTO headquarters on an ongoing basis. Nikolai Bordyuzha was appointed to the post of Secretary General of the CSTO for another three-year term. May 15th of this year. An extraordinary anniversary session of the Collective Security Council (CSC) of the member states of the Collective Security Treaty Organization was held in Moscow, dedicated to the 20th anniversary of the signing of the Collective Security Treaty and the 10th anniversary of the creation of the CSTO. The leaders of the CSTO countries discussed the optimization of military and military-technical cooperation, emergency response, information security, the fight against drug trafficking and terrorism. Session of the Collective Security Council "Moscow - December 2010"
The heads of the CSTO member states discussed the results of the organization’s work in 2010. The focus is on measures to improve the effectiveness of crisis response mechanisms, to strengthen the security of the participating countries and the region as a whole.